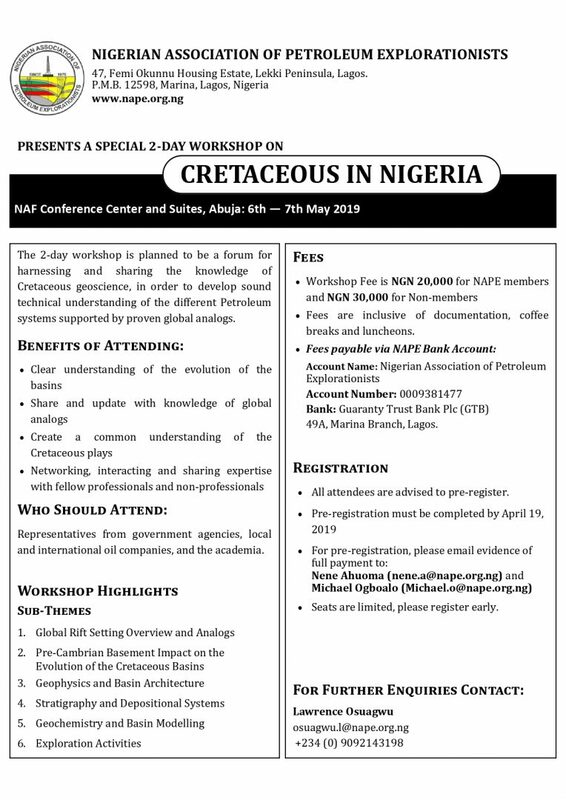 This is why the organisers of the workshop have christened their proposed parley the Cretaceous In Nigeria Workshop. It is two day affair, organised under the auspices of the Nigerian Association of Petroleum Explorationists (NAPE), and is to be held in Abuja from May 6 to May 7, 2019. It is to “be a forum for harnessing and sharing the knowledge of Cretaceous geoscience, in order to develop sound technical understanding of the different Petroleum systems supported by proven global analogs, says Muyiwa Olawoki, Ph.D, a retired ranking geoscientist with careers in Shell and ExxonMobil under his belt, who is currently running his own consulting firm, Geospectra Limited. The May 6-7 workshop will discuss, among others: Global Rift Setting Overview and Analogs; Pre-Cambrian Basement Impact on the Evolution of the Cretaceous Basins; Geophysics and Basin Architecture; Stratigraphy and Depositional Systems; Geochemistry and Basin Modelling and Exploration Activities.